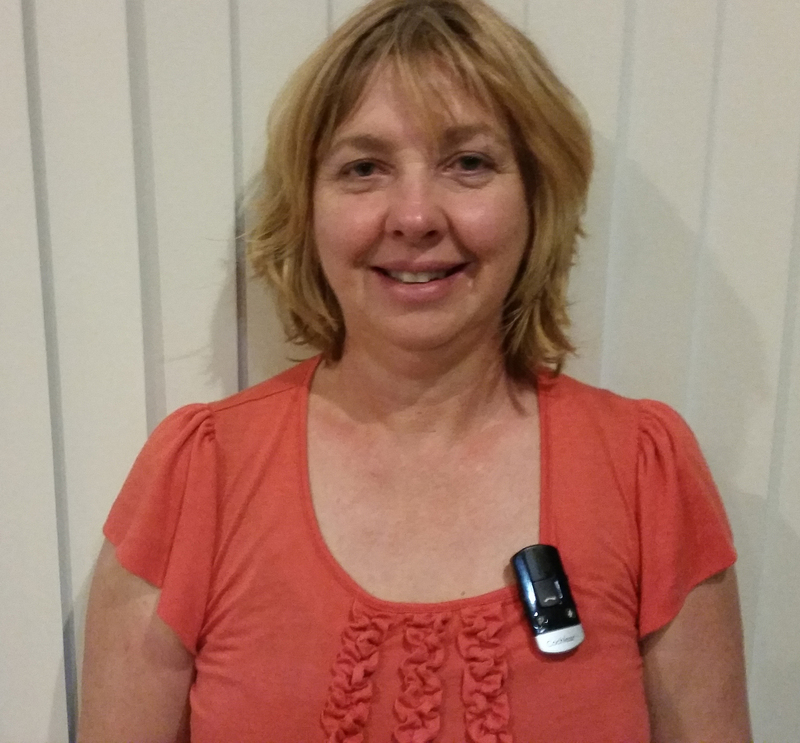 By Christina Lamp Having trialled the Cochlear wireless accessories last year, I was very pleased with the quality and the range of sounds. When they became available, I ordered all three accessories! Pairing the products can take a few goes and tests to work it out if you are not electronically minded like myself. Once the devices are paired, you can start streaming with the TV Streamer or Mini Microphone with a long press of the telecoil button on your Remote Assistant or Remote Control. Or you can do a long press of the upper button on the Nucleus 6. The Phone Clip + has its own call pick up/hang up button. 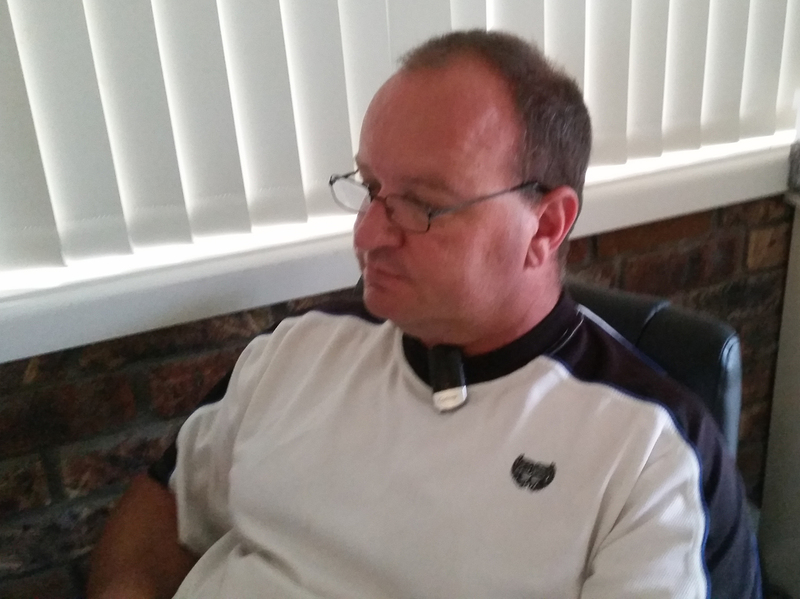 The Mini Microphone is inconspicuous – it even matches his shirt! This was easily my favourite product, a wonderful diverse product. I tested this in a number of situations. Very easy to use, switch the device on for the person who will wear it, adjust the volume using the buttons on the side as necessary, and select mini microphone on your remote. 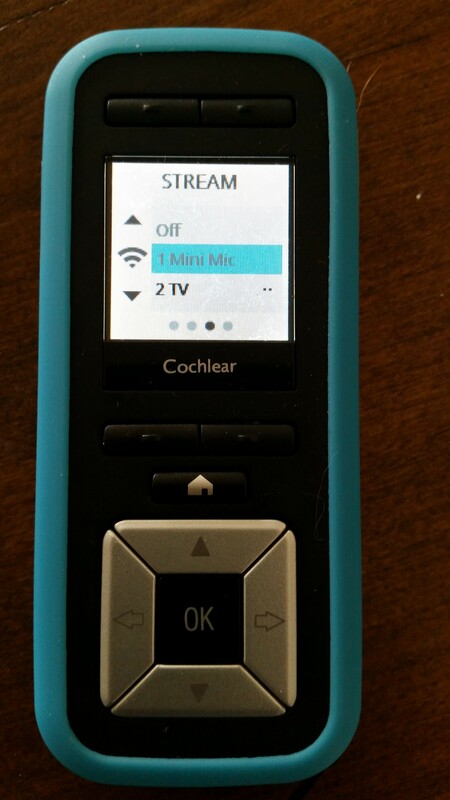 The device can also have music and audio streamed directly to the Sound Processor using a supplied cable connected to the mini microphone and the audio device. I haven’t tested this yet. The Mini Microphone is mono, so if you want true stereo, you have to use the Phone Clip + instead. I tested this at home, my walls are double brick and floors tiled, the rooms tend to echo. When I listen to Stereo Sound on the TV Streamer, I find it hard to hear the conversation around me. When adjusting the accessory mix to improve the sound around me, the person speaking is too soft to hear.. 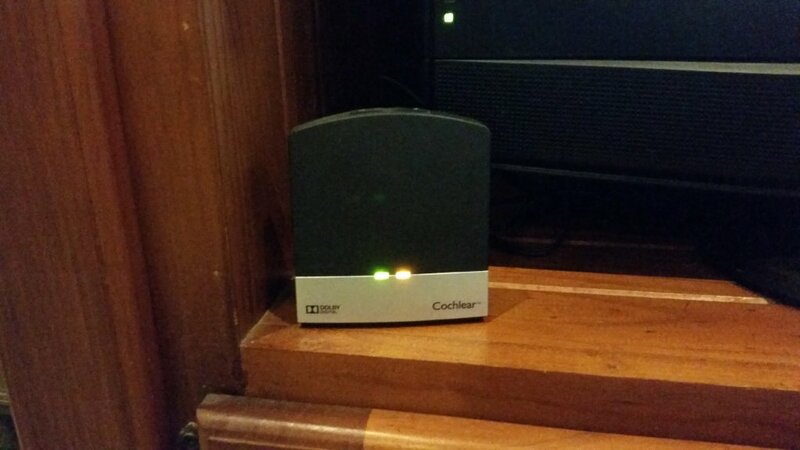 Since I have gone bilateral in Nov 2014, I found it much easier to just have the TV Streamer connected to one CI without adjusting the accessory mix to hear voices, while the other CI is used normally so I can hear people around me. I plan on testing the conversation around me again once my second CI has adjusted to hearing sounds. Here is how to change the accessory mix, which adjusts the loudness of the accessory input compared to the processor microphone. I tested this on different voices. Very easy to use, one click for answer, if you can’t answer double click. You can also use the device to listen to music from your phone in stereo. I haven’t done this yet as prior to CI I had trouble hearing music. This will be a next step for me to learn after CI number 2 has settled. This was a wonderful outcome for me and I happily purchased all three products and they have improved my life. Christina Lamp has had a hearing loss since she was 7 years old. By time she was a teenager, she had become profoundly deaf. 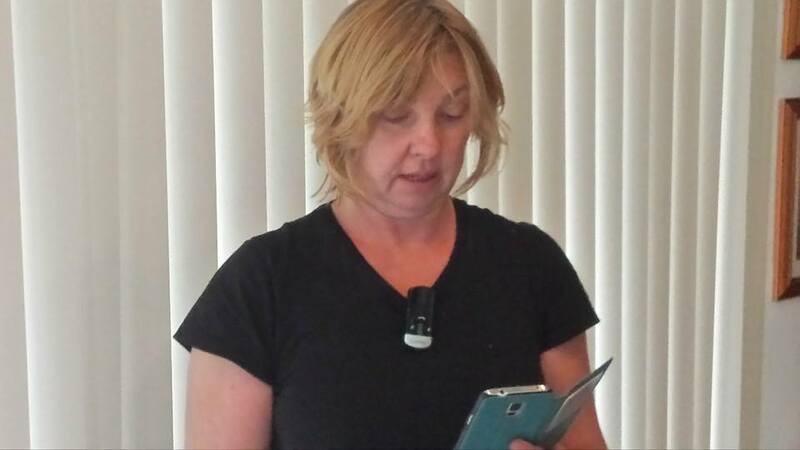 Christina relied heavily on analogue hearing aids and lip reading to communicate. After struggling with digital hearing aids, she received her first cochlear implant in March 2014 and then went bilateral in Nov 2014. Christina and her sister both have cochlear implants, but the rest of their family is hearing. 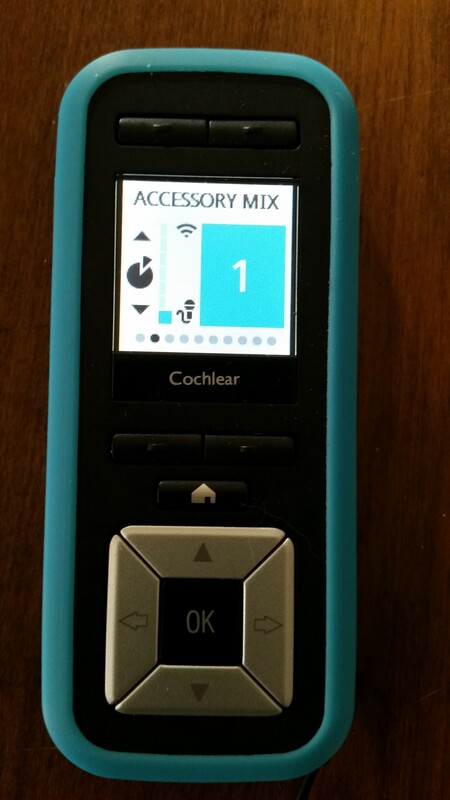 This entry was posted in Blog and tagged cochlear, cochlear implant, Mini Microphone, Phone Clip +, TV Streamer, wireless accessories by CochlearImplantHELP. Bookmark the permalink.